The chart of accounts often abbreviated to COA, is the foundation of the double entry bookkeeping system for a small startup business. It is basically a listing of all the accounts found in the general ledger that the business will use to code each of its bookkeeping transactions. This chart of accounts for small business template provides an example using some of the most commonly found account names. For a small business it is important not to over complicate the chart of accounts. A small business does not need many of the accounts required for a large corporation. The exact layout of the basic chart of accounts depends on the nature of the business, for example a service business does not require inventory accounts, whereas the chart of accounts for restaurants will need inventory accounts for food and drink supplies. In addition, consideration needs to be given to the accounting reporting requirements of the business, one business might simply want to know total sales, and will have only one sales account, whereas another business might want to know sales by categories such as retail, service, wholesale, online etc. and so will have multiple sales accounts. This chart of accounts for small business structure allows the business to easily identify accounts and account codes enabling double entry bookkeeping transactions to be posted and the trial balance and financial statements to be drawn up. In addition, the template sets out which financial statement the account belongs to, how the accounts are grouped and sub-grouped so that all similar accounts are grouped together, and indicates whether the account is normally a debit or a credit. The name of the account in the general ledger. 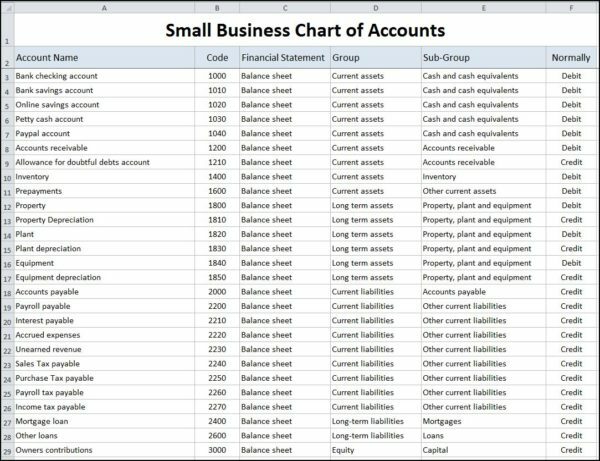 The account names will depend on your type of business, but the classification and grouping should be similar to this example chart of accounts for small business. Each account is given an account code or reference. In this chart of accounts for small business, the code is a number, but could be any appropriate system which allows accounts to be grouped together. For example, all the cash accounts have numbers in the range 1000 to 1999. It is normally better to use numbers for account codes as this speeds up the entering of double entry bookkeeping transactions using the numeric key pad on a typical computer keyboard. The purpose of the account code is simply to group similar accounts together, and to provide an easy method of referring to an account when preparing journal entries. When allocating account codes (chart of accounts numbers) don’t forget to leave space for additional accounts and codes to be inserted in a group at a later stage. For example the inventory codes run from 1400 to 1499 so there is plenty of room to incorporate new categories of inventory if needed. This column shows the financial statement in which the account appears, and for a profit making business is either the balance sheet of the income statement. The group refers to the classification of the account into one of the headings shown below. It generally helps to keep the most used accounts towards the top of each group as this helps speed up locating the account and the posting of double entry transactions. 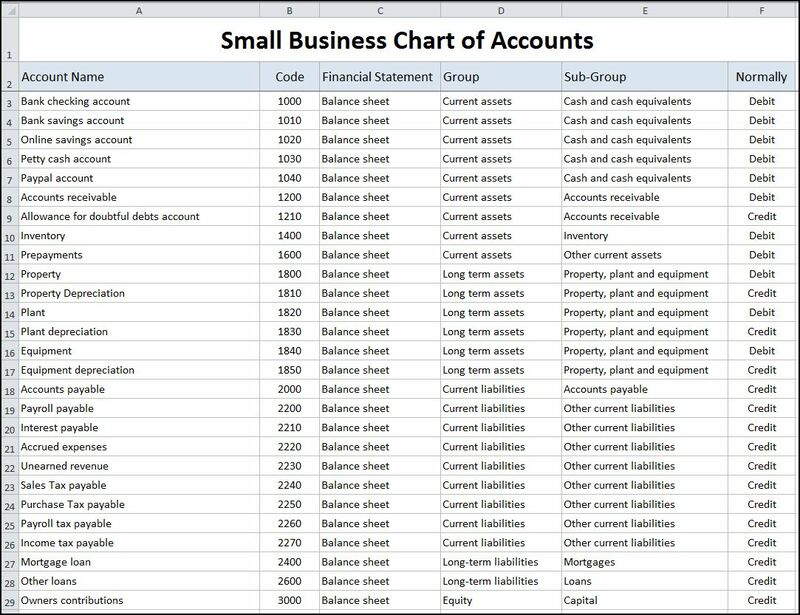 In this chart of accounts for small business template the sub-group column divides each group into the classifications shown in the listings below. The purpose of the sub-group is to classify each account into categories that the business need to produce the balance sheet and income statement for accounting reports. For example, in this chart of accounts for small business, the expense accounts are sub-divided into business functions such as research and development, sales and marketing, and general and administrative expenses. This column is for information only to indicate whether the account is normally increased by a debit or a credit. For example expense accounts are normally increased by a debit entry, whereas income accounts are normally increased by a credit entry. Further information on the use of debits and credits can be found in our bookkeeping basics tutorials. The chart of accounts for small business template will help you to produce your own chart of accounts, and is available for download in Excel format by following the link below. Users use this bookkeeping chart of accounts for small business template at their own risk. We make no warranty or representation as to its accuracy and we are covered by the terms of our legal disclaimer, which you are deemed to have read. This is an example of a accounting chart of accounts template that you might use when setting up a chart of accounts. It is purely illustrative. This is not intended to reflect general standards or targets for any particular company or sector. If you do spot a mistake in the general ledger chart of accounts, please let us know and we will try to fix it.